Africa is a prime setting for mysteries these days. The books run the gamut from the pleasant and meandering Precious Ramotswe books by Alexander McCall Smith to The October Killings, a jangling look at what has become of South Africa in the days after the rejection of the apartheid government. South African author Malla Nunn has a series (A Beautiful Place to Die and Let the Dead Lie) set at the dawn of apartheid. She deals with what happens to a white man of conscience in a country that demands loyalty to an immoral cause. 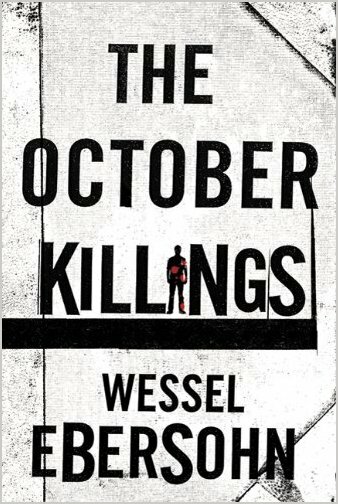 In contrast but also in complement to Nunn's series, Wessel Ebersohn deals with present day South Africa, where institutionalized racism has been abolished but where there are still many problems stemming from that apartheid past. Abigail Bukula is a 35-year-old black woman, a minor official in the Justice Department, and she, too, is a person of conscience. When an Afrikaaner ex-soldier of the apartheid regime comes to her for help, she gives it. Leon Lourens saved her life twenty years ago when the house in Lesotho in which she was staying was raided by the South African military. Abigail was captured, but on October 22, she and her fellow prisoners were freed in a rebel countermove. The circumstances of this event and the genesis of Abigail and Leon's unlikely relationship are slowly unveiled throughout the book. Leon is frightened because other soldiers from the regiment that attacked the house in Lesotho are dying on October 22, one each year, and someone associated with that night is responsible. She has not seen Leon since the raid, but she has not forgotten her debt to him. When she and her angst-filled secretary, Johanna, do further research, they realize that the problem is larger than they thought. Abigail stumbles across prison psychologist Yudel Gordon, who formerly worked under the apartheid government, was released because he was white, then reinstated when his progressive rehabilitation theories prove useful. There are many people like Yudel who were tools of the apartheid government but who tried their best to co-exist with everyone in a stratified world. Eventually acceding to Abigail's request for help, Yudel's primary aid comes in the form of Sherlock Holmes-like observations and intuitive insights into the psyche of the man who is ritually killing the ex-soldiers in October. Ebersohn has created a thriller with a serial killer. But unlike other authors of the oh-so-many thriller/serial killer books out today, he has also created characters with heart and a hard-won thoughtfulness of who they are. Abigail and Yudel have fragile places in the new world, but their consciences overcome their fear of losing that precarious and precious safety. Ebersohn has done a great job fleshing out other intriguing characters: Robert Mokoapi, Abigail's husband and man-on-the-way-up in the television news business; Freek Jordaan, a police commissioner and Yudel's friend; Rosa, Yudel's wife; and Van Jaarsveld, the head of Leon's regiment the night of the raid. Ebersohn's work provides a poignant look at a South Africa still fractured but healing. Read together with Malla Nunn's books, they provide a fascinating fictional one-two punch to apartheid. More importantly, while The October Killings is definitely a political statement of life post-apartheid, it is more a story of the connections people make with each other, one human to another. Dr. Ruth Galloway, a forensic anthropologist in England, finds a storyline worthy of her in this second book in Elly Griffiths' series. The Crossing Places, the first book to feature Ruth, was well written but lacked a tightly worked ending. Griffiths has remedied that with this commendable follow-up. Ruth is a slightly overweight, out of shape academic. Because of circumstances depicted in the first book, Ruth is now slightly overweight, out of shape, and pregnant. Since there is no possibility of winding up with the father of her child, she chooses to ignore her pregnancy at first, concentrating instead on winding up her school year and discerning whether a modern crime has been committed when a child's bones are discovered at a construction site. Among the fine characters that populate this book are Harry Nelson, the police detective she met in the first book; her friend Cathbad, a Druid/amateur archaeologist/sensitive soul; and Shona, her irrepressible BFF. They are each given their own strong personalities and we say, "Yay!" Griffiths draws an atmospheric picture of the area around Norfolk, with its heavy mists and lonely stretches. In addition to the main mystery of the victim's identity is a sedimentary mystery, which gives Griffiths a chance to gently educate us in the archaeology and history of an ancient land that has seen many changes. Humor is not a main ingredient in this book, but there is some and it is well placed. From the slapstick (DCI Nelson accusing himself of being unsophisticated: "'You know how thick I am. I don't even eat yoghurt because it's got culture in it.'") to the gently acerbic ("Eventually a teenage boy masquerading as a doctor appears, examines her head and tells her she can go home. "), Griffiths gives us a smile just before she encases us in darkness. And there is darkness. This is not a tidy Agatha Christie drawing room mystery, but rather one that uncovers the sordid and grotesque nature of a hidden black heart. Griffiths' dialogue, her pacing, and her humorous and human touches, especially concerning Ruth's pregnancy, are spot on. Oh, what fun! Steampunk, great characters, a rousing adventure! That's this book in a nutshell. Eliza Braun and Wellington Books are agents of the Ministry of Peculiar Occurrences, Britain's hidden asset in the war against the unseemly in Victorian London. The fact that Eliza and "Welly," as Eliza not-so-fondly calls Books, are both agents of the Ministry is the only thing they have in common. Eliza is a "colonist" from New Zealand and therefore subject to the slings and arrows of the purist upper-classes of England. Welly is one of those upper-class toffs. Eliza makes spectacular appearances, loaded with dynamite, guns, knives, and moxie. Welly is the quiet and methodical head of the Ministry Archives in the leaky basement of the secret Ministry building. You can see already where this is going, can't you? They meet when Eliza is sent to rescue Welly from a prison in Antarctica where the nefarious House of Usher has taken him. With guns blazing, dynamite blasting (Eliza) and puzzle-solving (Welly), they work as a team to escape the dungeon. And that's only chapter one. And it has little to do with the current story, except to introduce the characters to each other. Back at the ranch: For past and present sins, Eliza is demoted to be Welly's assistant in the Archives. Their boss, Doctor Sound, probably has an ulterior motive, of course, but it's not apparent, nor does it have a logical basis; it just gets the story going. And here is the story. Eliza's former partner, Harrison Thorne, has been committed to Bedlam. He went bonkers after handling a case on his own. While cleaning up the Archives, Eliza stumbles across Harry's notes from that case. After a poignant visit to Harry and more investigation, Eliza and Welly learn of the secret Phoenix Society. With much prodding from Eliza and trepidation from Welly, they surreptitiously begin reconnaissance on their own. They eventually land in the belly of the beast, so to speak, and more blasting and shooting and puzzle-solving ensue. What's there not to like? There are side mysteries which are introduced but not solved in this first book in a projected series. Why was Welly kidnapped? What is the House of Usher? Why are two characters named Barnabus and Angelique Collins, also character names in the cult series, "Dark Shadows"? Why is one of the other agents named Bruce Campbell, the name of a cult movie actor? Methinks there are a lot of in-jokes in this book. Where does Doctor Sound go when he slips through the hidden door in the basement? What will become of the Ministry Seven, street urchins whom Eliza and Harry used in much the same fashion as Sherlock used the Baker Street Irregulars. Before everyone runs out and gets a copy for their preadolescent steampunks, know that adult sexual talk and games are a part of the action. I didn't get much sleep last night, because The Lock Artist was compulsively fascinating. The premise of a mute teenager who is a genius at cracking locks and safes was too good a story gimmick. Hamilton has a wicked sense of timing and knows how to draw the reader forward, slowly and torturously, towards the solutions to the mysteries he has created. Mike was traumatized as a young boy, but what happened isn't revealed until towards the end of the book. In the meantime, we learn that he lived with old Uncle Lito after the tragedy, that he managed to get into small-time trouble as a teenager, which led to big-time trouble, and that he is writing his story from prison. Throughout all of this, he has remained mute, a silent witness to human deficiencies and defects. Hamilton teases out these various storylines with excruciating slowness, but it's never annoying -- it only leads to hyperventilation on the part of the reader. Although Mike is ostracized in school because he doesn't speak and he is haunted by the traumatizing incident in his past, he isn't bitter, just wary. He is alone a lot of the time and lonely, and finds a strange sort of psychic relief in opening padlocks and locked doors. He finally graduates to safes, but it isn't clear how this comes about until much later in the book. One of the attractions of this book is Hamilton's description of the intricate art of lock and safe breaking. Who knew that this esoteric topic could be so hypnotic? Mike is a sweet and sympathetic character. His girlfriend, Amelia, is sweet and perceptive. The safecracking gimmick is mesmerizing, and Hamilton does a great job drawing the various threads together in the end. This is another one of those novels that can't be read without having read the previous ones in the series. I was at sea with all the police personnel introduced willy-nilly and mostly lacking descriptors. Ann Lindell was clearly the main character in this book. She is one of the homicide detectives in Uppsala, Sweden. But who the heck are Ola Haver, Sammy Nilsson, Charles Morgansson, Beatrice Andersson, Allan Fredricksson, Eskil Ryde, Asa Lantz-Andersson, and Ottoson? I managed to pick the following out: Ryde and Morgansson are with forensics. Eventually Ottoson emerges as everyone else's boss (Lieutenant, Captain, Chief, Sarge, first name?). Jonsson and Martensson pop up a couple of times. They are technicians, and we don't really get to know anything about them, so you can safely let them slip from your thoughts. Yes, I could go back and read the book again and take better notes. But that's not going to happen. Besides, the play's the thing. Two 70-ish men clearly have been murdered. They both seem to have led innocent, productive lives, and there's no link between them. Another 70-ish man is missing. His daughter appears more and more fraught and frantic throughout the book, but is it because her father is missing or because she is glad he is missing? Although for a long time their story is presented separately from the other two cases, the reader must hazard a guess that eventually there must be a connection, otherwise the juxtaposition of the stories would be aimless. Is there a serial killer ranging the countryside looking for old men to bash on the head? Is the professor another victim? Although the story follows a few of the detectives as they track down clues and live their lives, it is to Ann Lindell that Kjell Eriksson returns over and over. She is a 30-something, single mother. Her preschooler is her heart's delight, but it is difficult to balance the stressful and demanding work of a detective with that of a mother. Eriksson sympathetically presents her dilemma. It really wasn't until about three-fourths of the way in the book, when Ann is trying to find some way to link the cases, that it finally starts to move along. It is at this point, too, that we realize that Laura, the professor's daughter, is hauling some serious psychological luggage. The police procedural part -- once I gave up trying to figure out how all the detectives related to each other, what they looked like, how old they were, etc. -- was interesting, especially when one of the detectives has a brainstorm, involving Queen Silvia, about why the old men were killed. Let's summarize. Characters were confusing. Ann's story was good. Book lagged until the last fourth, but that part was good. Interesting side bits. Probably would have enjoyed it more had I read The Princess of Burundi first.